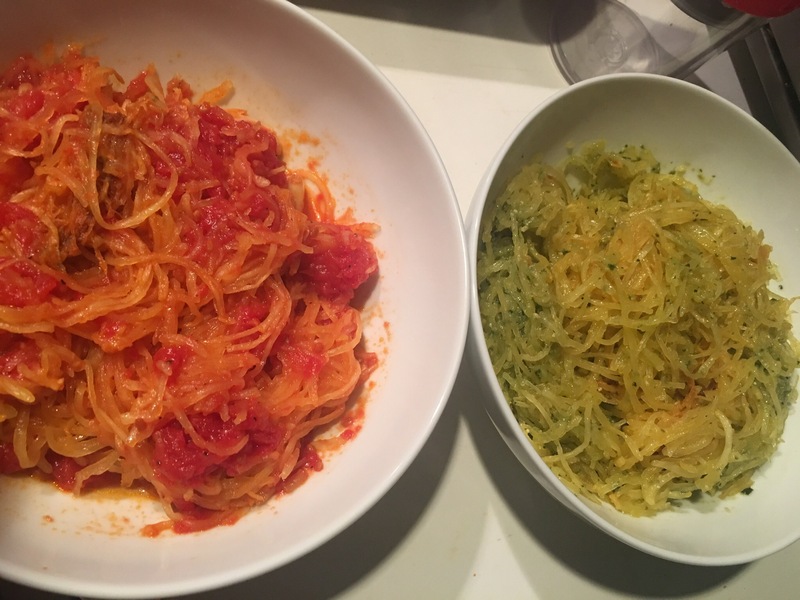 Spaghetti squash with marinara and pesto – Hurried Home Chef! Found these on sale, and wanted to see what the fuss was about. 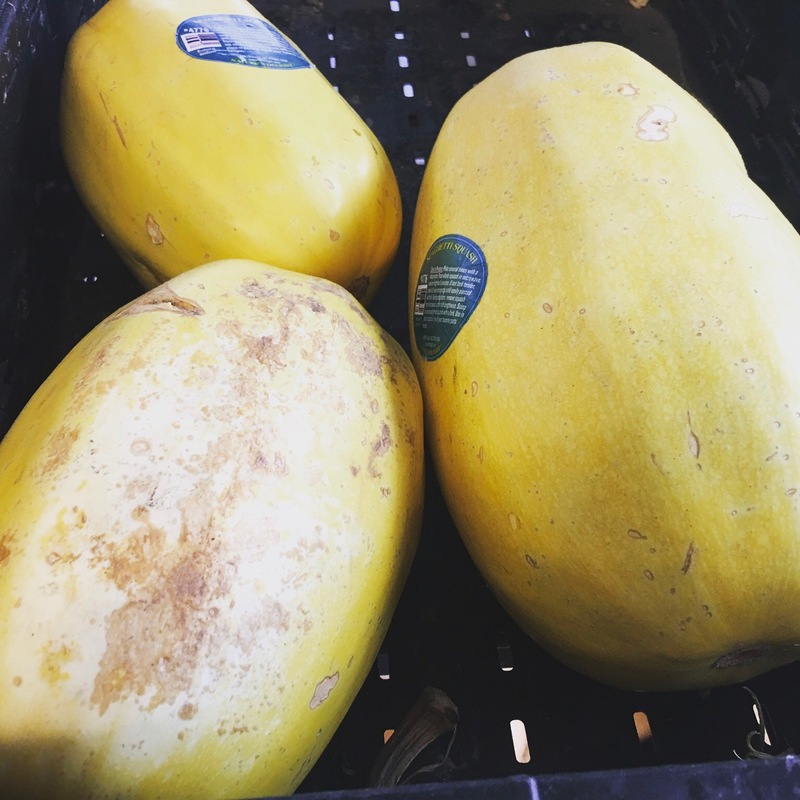 The directions on the actual squash say you can microwave them after piercing a few holes. I had the oven on already, and went that way instead. 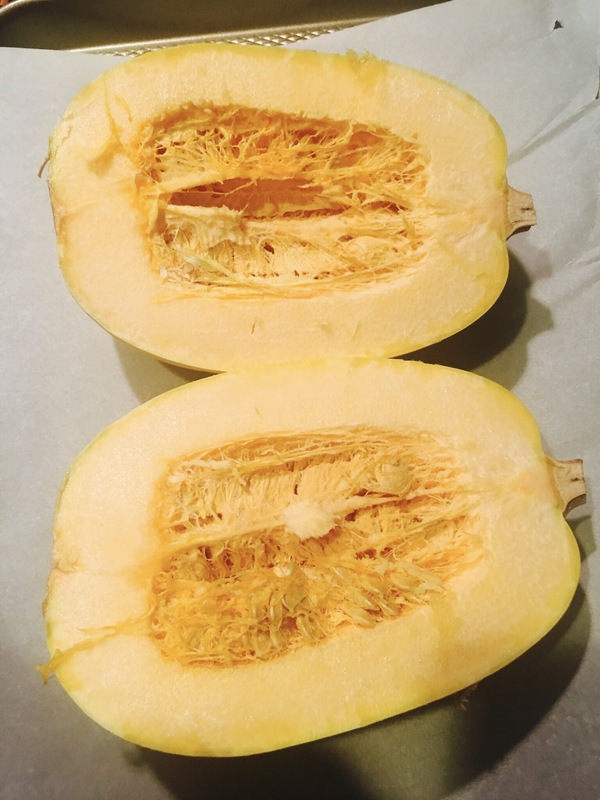 I carefully cut it in half, if the knife is hard to move, rock the squash back and forth instead of trying to move the knife a lot. Then remove the seeds. 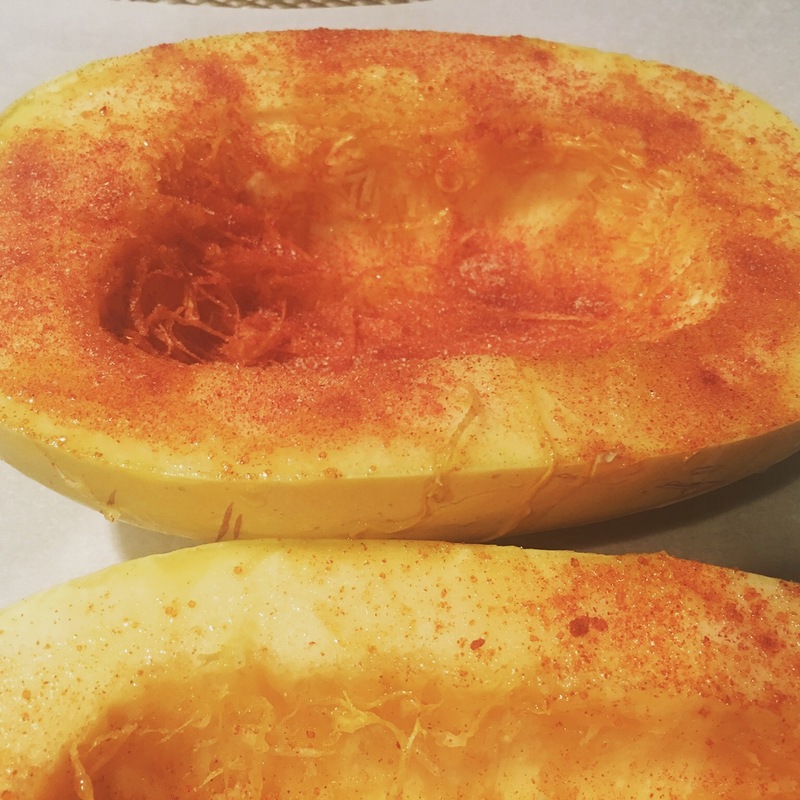 I seasoned with olive oil, salt, and some ground habanero because I like some heat. Then bake at 375 for about an hour. Meanwhile, I started a sauce. Since I was using a cast iron Dutch oven, I only put the heat to medium (they hold heat better). 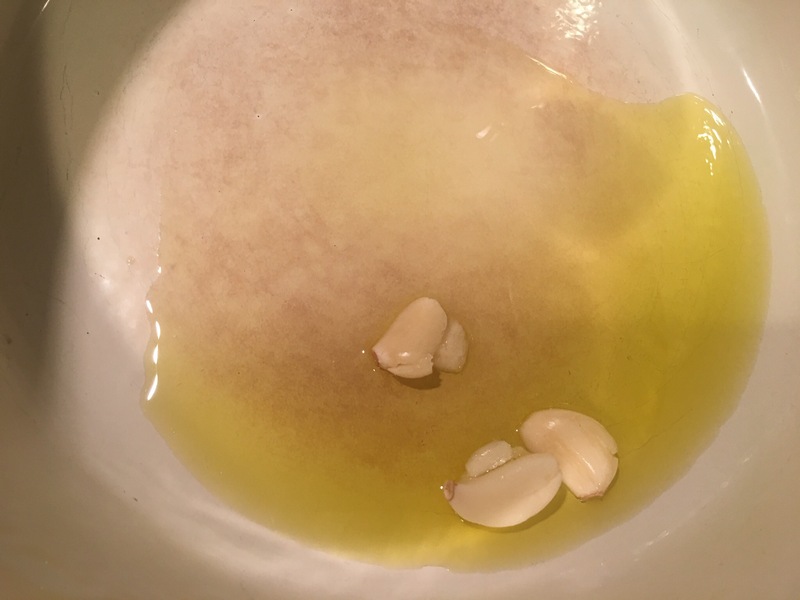 I take a good quality EVOO and fresh garlic slightly smashed open and cook for a bit. 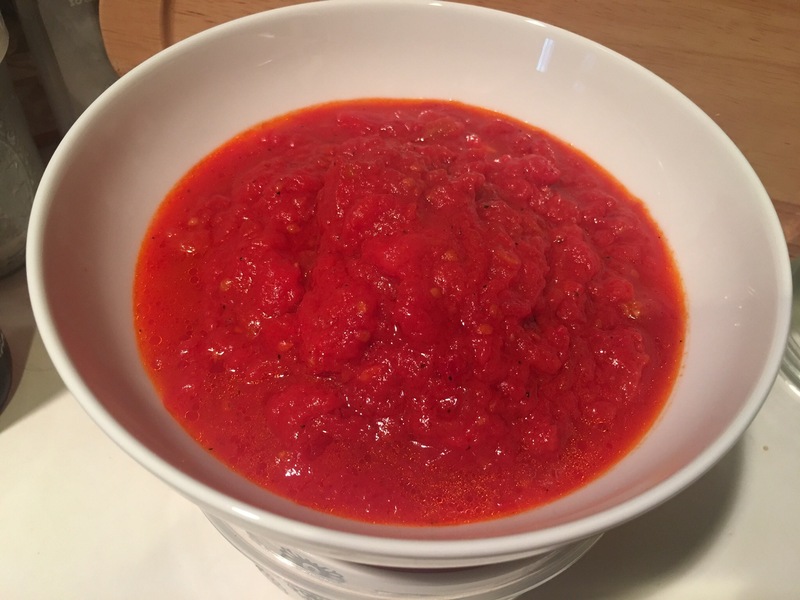 Then I add a can of whole tomatoes, I use the ones from Italy, there really is a difference in the flavor. Add some salt and pepper. 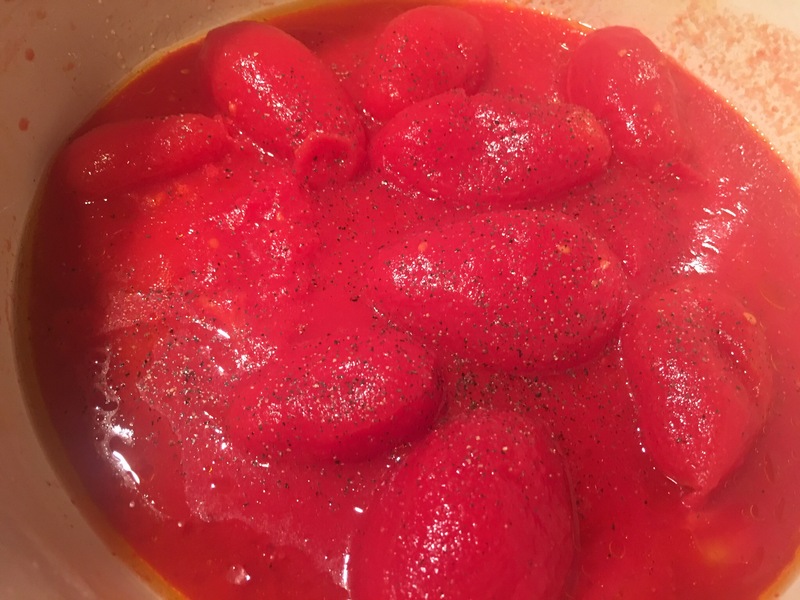 Traditionally, you should remove the garlic before you add the tomatoes, as they are just supposed to add a hint of flavor. 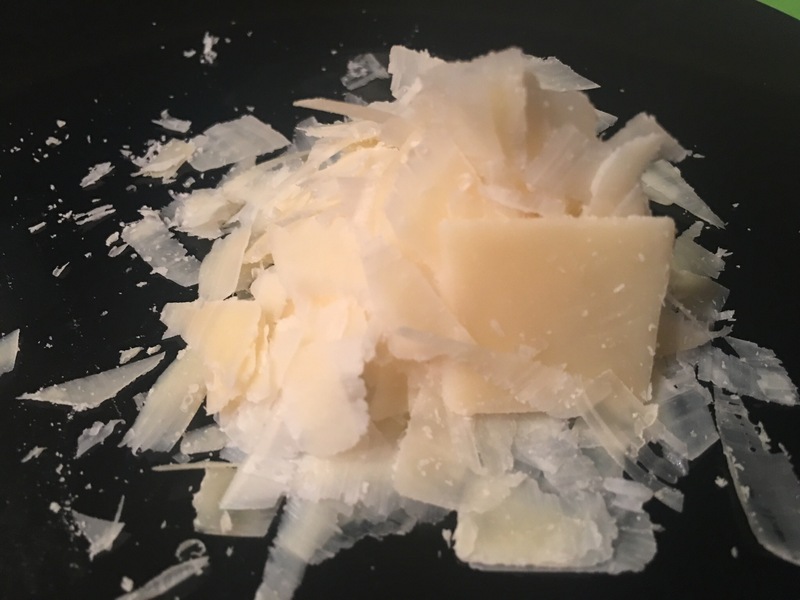 While all of this is happening, I will grate some parmigiano, this doesn’t melt very well, so I like to shave it for presentation sake. I gave these a poke after about 40 minutes, and put them back in. They took almost a full hour. At this point, I would tear up some fresh basil and put it on top when it is still super hot, but alas, I killed the basil plant! You can make a pesto for this as well with 1 cup fresh basil leaves, 1 clove garlic, 2 tablespoons pine nuts, 1/4 cup EVOO, 1/4 cup grated Parm (not the shaker stuff please) salt about 1/2 tsp–blend. Or buy a jar! 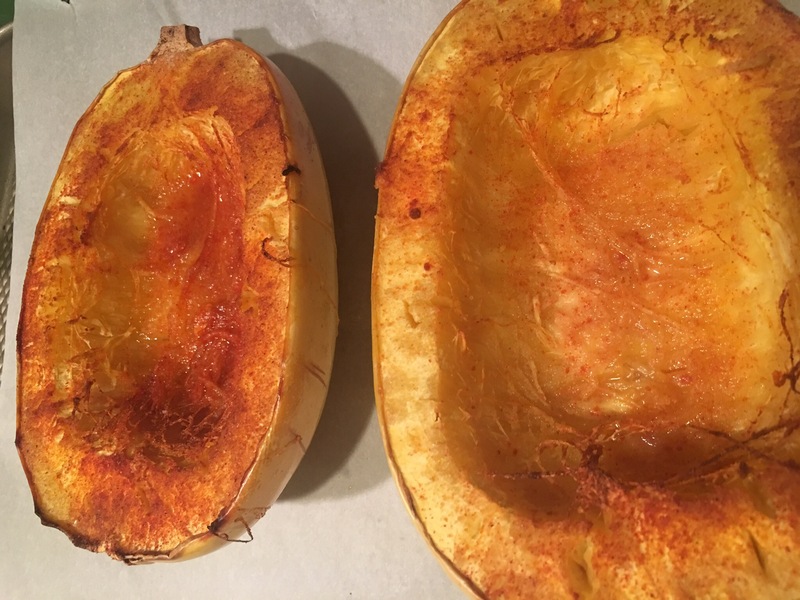 With a fork, I loosened the squash from the sides and put into a bowl. 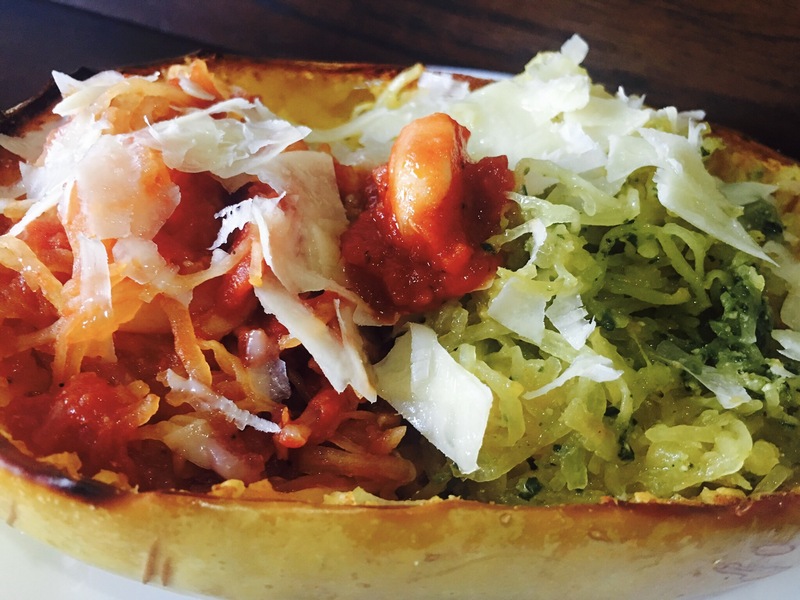 You can simply put the sauce on top and melt some cheese and call it a day. For the sake of presentation, I mixed the sauces together with the squash. Taste and season again. The put back into the squash and serve! I went with half and half, looks great and you get some variety. The pepper was key here, I love the flavor with the heat. If you have vegan’s coming, put the cheese on the table instead of on top! Pingback: Japanese eggplant rollatini – Hurried Home Chef! 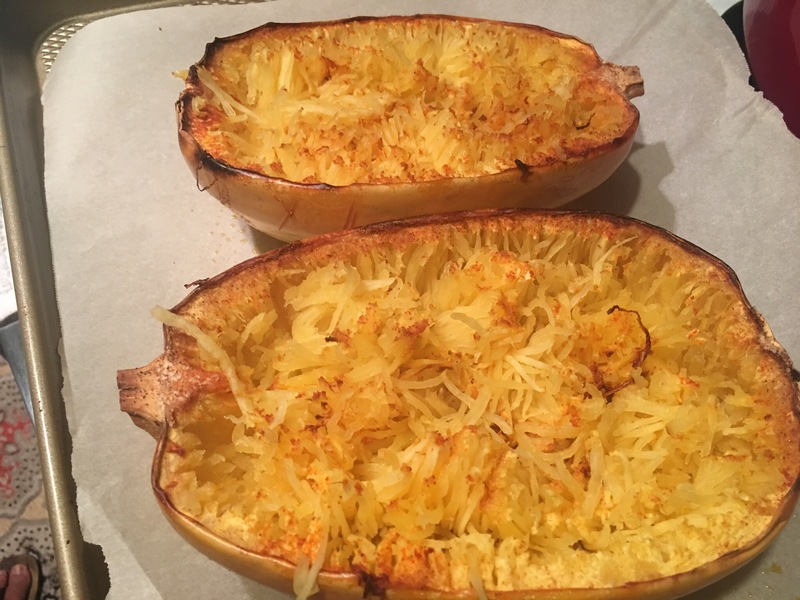 Pingback: Stuffed shells two ways: cheese in marinara and chicken alfredo – Hurried Home Chef!